It doesn’t matter if you live in warm region or you are preparing yourself for the winter heating season -humidity plays a vital role on quality of air inside your house. And what better way to improve the surrounding air than to start measure and understand humidity. 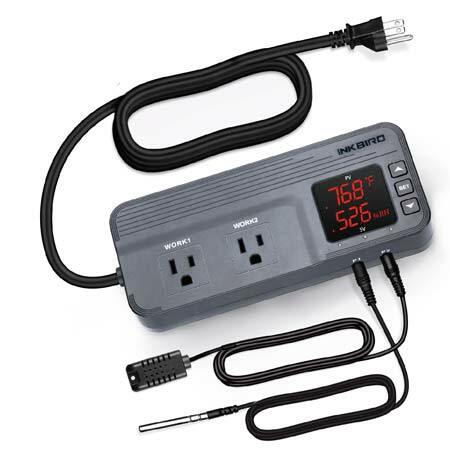 But first and foremost, in order to get the most of this product review article (the best in the digital hygrometer home class) let’s give a short description of what actually is hygrometer. A humidity meter is measuring instrument for determining the humidity, or in particular for detecting the amount of water vapor in the air. The unit of measurement is expressed in percentage: %. 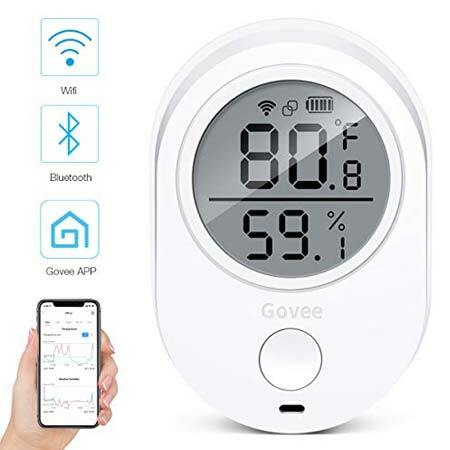 The humidity gauge is extremely useful device and excellent addition to other home measuring instruments like the home weather station or the indoor-outdoor thermometer. Which are the new models in 2019? 2019 is almost here and we are updating our guide with 3 new humidity tracking gauges. The first one – a Bluetooth/WiFi device with phone application, suitable for industrial applications, where direct visual monitoring is not always an option. With the possibility to becomes an effective monitoring system when you add more than one device to your phone app. The second one – a temperature and humidity controller. Any time you want to switch some device on or off, depending on the current level of humidity, use this model. It is Perfect for DIY projects. We can think of many application for such gauge – meat curing, wine and beer producing, warmer regulation and many more. The third one – a typical household model with touch screen – useful when switching between options. Equipped with all the necessary readouts, with comfort tracking, and convenient mounting options. This is a comparison table of all the the best products in this class. Short review about each of them is available few scrolls bellow. Humidity is an important factor for numerous industrial (painting and coating, greenhouses or chemical) and meteorological processes, as well as in residential areas like homes, apartments, and offices, where comfortable humidity levels are necessary. Very useful at homes where a humidifiers and dehumidifiers are used to fine tune them. These types of gauges are also valuable in humid rooms where mold can be a problem. The other important factor very closely related to humidity is the dew point. Dew point is the temperature where the air becomes saturated with moisture. The closer the air temperatures to the dew point the more likely condensation will form on surface areas. Condensation can be very harmful to chemicals, building materials, and any organic material. Creating comfortable environment for your reptiles is as function of right temperature, humidity, and a sufficient amount of ultraviolet radiation. For example the humidity inside the terrarium can be higher than the total humidity of the surrounding space, creating a micro-climate for your pet. Using humidity gauge to track and adjust these difference is a good idea. There are many serious consequences of prolonged exposure to high humidity, including weakening of the springs, cracks in the lacquer, excessive string height, and a general reduction in the sound quality of the guitar. Although some problems can be corrected by a competent musicians, they can leave your musical instrument damaged. So using hygrometer for monitoring and preservation of musical instruments is a must. Preservation of cigars is highly dependent on the level of humidity. Humidors are designed for this exact use case – long-term storage of cigars. There main function is to maintain relative levels at which cigars are stored for as long as possible, and without losing their taste and aroma. Humidors not equipped with build in meter need one to watch for appropriate level of humidity. Correct humidity is essential for proper hatching. To get a high hatchability, you need to know the exact conditions inside the incubator. The correct micro-climate determines the quality of the incubation. Even the smallest deviations in temperature and humidity can lead to death or disruption in development of chickens. There are different types of hygrometers defined by the method they use to measure the humidity. The category we are going to list and review today is the digital humidity gauges that use electronic capacitive sensor with integrated analog-to-digital converter. The modern digital hygrometer uses these solid state sensors which have the ability to change their electrical parameters in proportion to the value of relative humidity which they are exposed to. These sorts of hygrometers are extremely accurate and compact, although they obviously need a power source to operate. Govee is a smart home device company making different gadgets for integrating in your home. The H5051 is their take at hygrometer/thermometer class. Powered by two batteries, with life of around 6 months, the device comes in two variants – WiFi (2.4 GHz) version an Bluetooth (4.0) only. The WiFi is suitable for bigger homes and industrial settings with large spaces and more floors. The Bluetooth only version is better for apartments and smaller businesses. The unit comes with mounting bracket with adhesive tape at the back. Just stuck the hygrometer at your desired location and you are good to go. The bracket is detachable, so placing the device at different locations is always and option. A couple of words about the display. It is durable, easy to read with bigger numbers and all the necessary information. Off angle reading is quite good for times with direct visual access. But most of the time you would not need it, because the app has all the functions to monitor the variables trough your smartphone. The app is well made, easy to navigate, with option to see the current and historical data. You can also export your data to a spreadsheet for later use. The app has a options to set an alerts if the readings are outside of your desired ranges. If there is no connection between the phone and the unit, the data is stored locally. When the connection is on again, the data is transferred to your mobile device. Some people are misled, because of the WiFi, that you have the option receive the readings when far away from home. This is not possible, this model operates only in the range of WiFi and Bluetooth. There are much better solutions for remote temperature monitoring when not in the vicinity of your home. ThermoPro TP55 is a stylish device that responds quickly and measures humidity quite accurately. Powered by two batteries it can go without service for up to six months. The display (4 inch LCD) is easy to read from any direction, and visible even from distance. 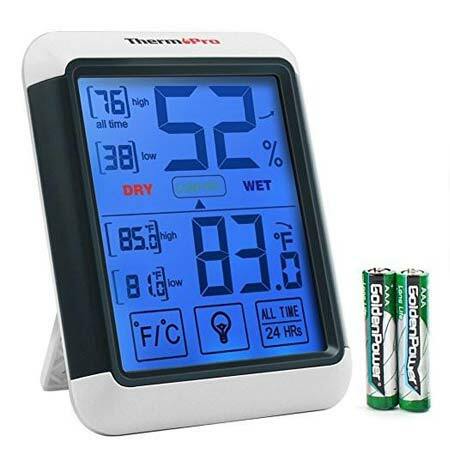 ThermoPro has integrated a touch screen for controlling a part of the functionality – temp scale switch (Celsius and Fahrenheit), backlight, and 24 hours historical data. The historical data has two modes – all time high/low and 24 house high/low humidity. Useful options when you want to know how was the “weather” at your place during the day. Humidity level icons show if your house has low, comfortable or high humidity. levels. 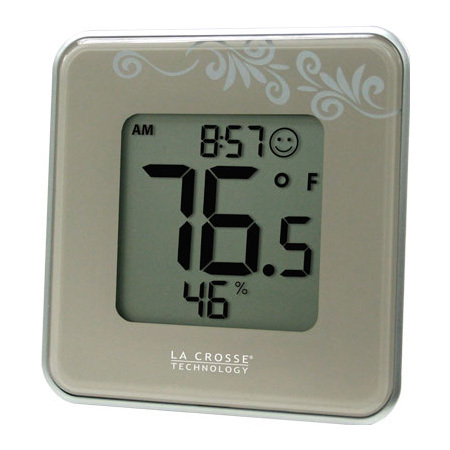 ThermoPro TP55 displays temperature and humidity trends, useful for humidifier or thermostat changes. For mounting you have couple of options – table top, wall mount and magnet. The magnets are strong enough, but when on a wall, the device takes some time to measure the ambient air data. Overall a good device that fulfills its purpose. Turn it on, stick it in the basement, and find out the best time to switch your dehumidifier to prevent mold growth. 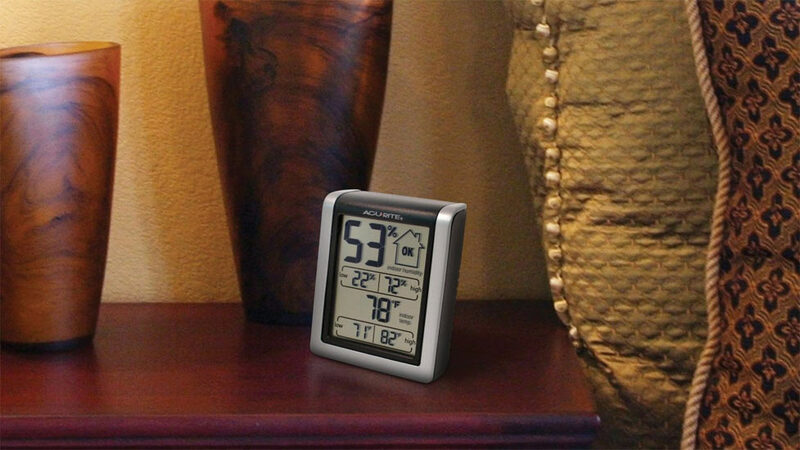 Accurate’s digital hygrometer is a compact little gadget that offers a lot of information at the tip of your finger. It has a compact display that will give you the current humidity and temperature levels as well as the lowest and highest values it had seen during the day. The first thing we have to say about this device is that it is much smaller than the other products in this category. It measures at 2.4 x 1.3 x 3.1 (in) which makes it a very small and compact. You can put it next to your monitor or bed table and it won’t take much space. We actually like the size of this unit, and it looks a whole lot nicer and more compact than the other more clunky competitors. The gadget has magnetic back and folding stand for different mounting options. Now about the accuracy. First of all let’s stress that we are focusing on the hygrometer and not the thermometer. There are different mixed reviews around the Internet form other people that have found mixed things regarding how accurate is the 00613A1. What we have found is that the model is off by 3% to 5% depending on how you handle and place it. If the accuracy is of most importance to you this unit may not be the best choice. But if you are only interested if the current humidity level are- OK, low or high this might be the right device. In the upper right corner there is icon with convenient representation of those states. 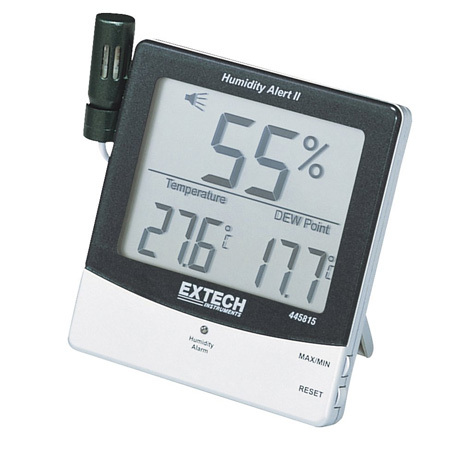 Extech’s model 445 815 humidity alert meter features a triple display for temperature, relative humidity, and dew point. Visual and audible alarms can be set to alert the user if the humidity level exceeds a preset limit. The humidity alarm can quickly be programmed by pushing the buttons on the side of the. An icon will appear on the display to show that the alarm is activated. Once activated the alarm will trigger if the humidity level exceeds a preset high or low limit. If you desired, the beeper and flashing light can be deactivated by pushing the switch on the back of the meter. The model also has the ability to displays the dew point. The unique sensor probe can be detached from the meter for monitoring temperature and humidity in a remote location like air-condition vents. The three ft. cable can be folded up and stored inside the case when the probe is attached. The remote sensor probe also allows the user to verify calibration the field by using the best possible calibration kits. This humidity alert meter is ideal for any application where humidity levels need to be monitored. Hardware for mounting is in the package and the built-in tilt stand can be used for sitting on a desk. 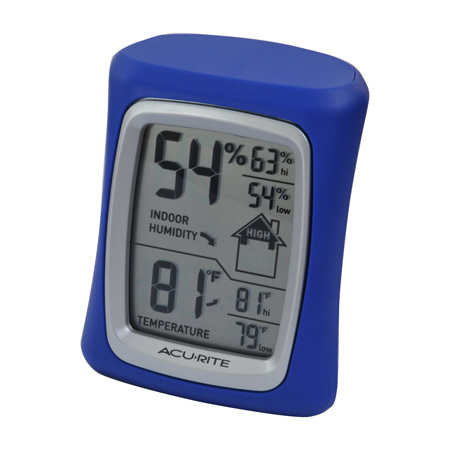 AcuRite 00326 device provides fast, easy, and cheap way to monitor humidity in the locations around your home – like kid’s room, celeries or basements. Similar to AcuRite 00613A1 this instrument also mesures current humidity, current temperature, and lowest and highest points seen during the day. The meter lacks a super precise accuracy and it is prone to error from 3% to 4%, when measuring humidity. It might not satisfy the geekiest weather enthusiast and home owners, but it works very well for people who want a cheap a method for in-house humidity monitoring. For them 00326 has a convenient house icon with trending arrows, which reports changes in temperature and humidity levels during the past couple of hours. The temp section has a similar readout but with much simpler layout. The unit build feels solid with big readable numbers on LCD display, easily viewable from multiple angles and directions. It has large magnet on the back so you can stick it on your refrigerator. 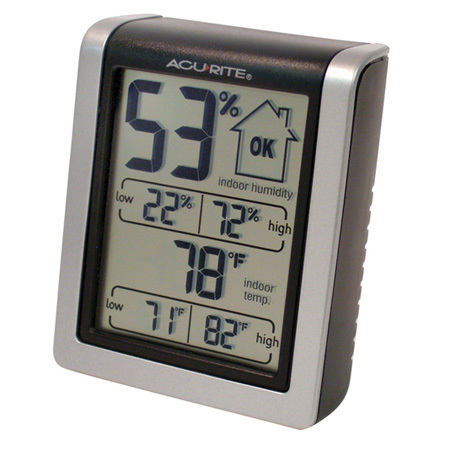 AcuRite 00326 Home Comfort Monitor is a small and inexpensive temperature and humidity monitor. And considering the price one of the best and safest bet. strong magnet for fridge mount. 24 hour min/max seems to have some point in the day when it resets, not truly a rolling value. 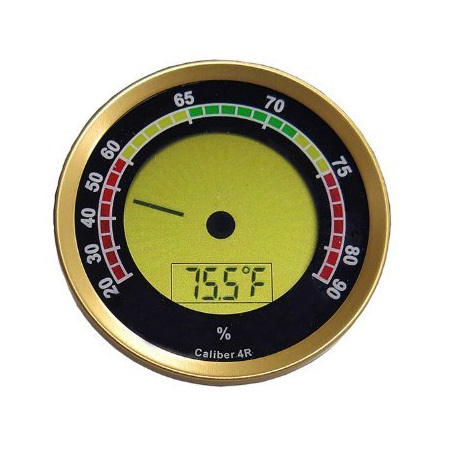 The Caliber 4R is well build, small, lightweight, humidity measuring meter designed and targeted toward cigar humidors owners. It has a plastic body with easy to red, color coded display with neat analog-digital feel to it. The device has a plastic body and works with two CR 2032 batteries that are included in the package, and have operation time for up to several months. It is very easy to use and with only two buttons on the back you can calibrate, change between Fahrenheit and Celsius, and get three day averages high and low for both temperature and humidity. It is accurate, but because it targeted toward humidor owners it has some indication limitation form 20% to 60%. But if you are cigar enthusiast or you are not interested in the lower part of the scale, this hygrometer is very accurate above 60%. Does this meter worth buying? We think it is. Of course, it is not a high end meteorology device and we don’t feel like we can put much trust on temperature reading, but if you are humidor owner or just want to keep an eye on humidity levels in an enclosed area, it will serve you well. Honeywell TM005X is a temperature and humidity monitor that allows you to gather data from inside and out outside of your home. To report the outdoor values the device uses a remote transmitter that connects wirelessly to your indoor unit. It uses two AA batteries (not included) for the inside and two AA batteries (not included) for the outside transmitter. With this device you have the option to add up to 3 additional outside sensors. Just by using the channel button, you can switch between 2 or 3 different locations around your property. The option to choose between Celsius and Fahrenheit as primary measurement unit is also available. The mandatory, for the most of the units in this class, min-max memory feature are included in this model. The TM005x is equipped with large LCD display for reporting the current levels. For convenience a small display is integrated inside the outdoor remote unit, so there is no need to go back inside your house to check the temperature in your backyard. With the one year warranty from Honeywell, the large LCD displays, good accuracy, and the ability to gather data from 3 different sensors, we think this is one of the best humidity meters on the market. 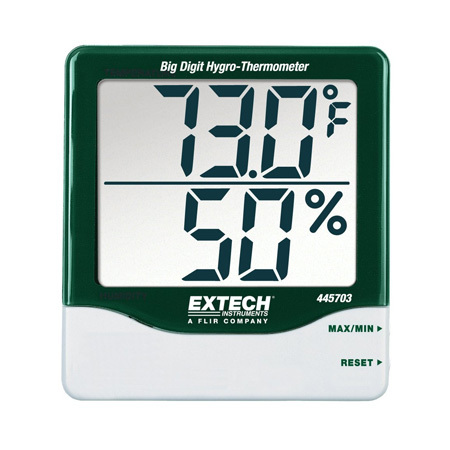 Now let’s make a quick look at this Extech thermometer and hygrometer. This is a really nice device with simple design and basic functionality. It is well build with primary material been plastic. The battery is a standard AAA model, which will probably get you more than 5 months of operation time. For setup and functions changes it uses only two buttons, so it is quite easy to use and maintain. Temperature measurement is in range of – 14 to 140 degrees Fahrenheit with accuracy of 1.8 deg. F. Which is quite good for gauges of this type? The accuracy zone ranges from 10% to 99% relative humidity with 2% error margin. The device also features a function that records both minimum and maximum data values. The display is really good with nice big readout digits (1 inch) and low battery indicator. It can be mounted on the wall or you can use the stand to put it any ware in your home. Overall a really nice modern hygrometer, that looks well build, and has all the necessary precision. This is WS10 thermo-hygrometer made by Ambient Weather. 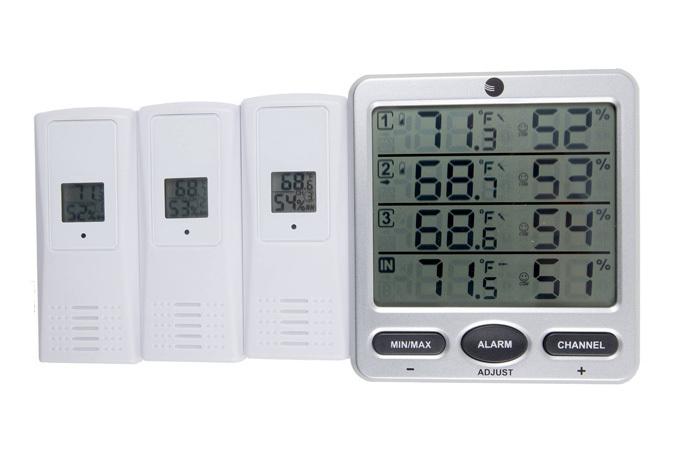 It has 3 sensors (can use up to 8) for measuring in and out temperature and humidity. The unit is large, compare to the previously reviewed devices. It is about twice the size of a regular cell phone. The display fills most of the space (3.70 x 3.40 inches) and it’s divided into 4 sections one for the unit and 3 for the remote sensors. Each section divided into two smaller sections for the temperature and humidity readout. The digits on the scream are nice, big well spaced, and visible for a distance. As we motioned before you can have up to 8 remote sensors to monitor the conditions around your house, office, or greenhouse. For convenience all the sensors have a small digital screen to display the recorded variables. The humidity range in which each sensor can operate is between 10% and 90%. The rate of data refreshed is every 60 seconds. WS10 is very accurate and has all the need data at the palm of your hand. If you choose to use more than 4 additional sensors the display has the option to automatically scroll between each channel. If set the alarm if will give you a signal when some threshold point is reached. Of course the abundance of data comes on a certain price – 10 are batteries necessary to power this array of sensors. One of the best and well build humidity meter that give no false reading, is simple to read, simple to use, and comes at a great price considering the 4 sensors. This handy gauge – described by the manufacturer as Indoor Comfort Level Station – is a handy instrument for checking the ambient conditions in your home. It is well build and has all the main features this class has to offer. 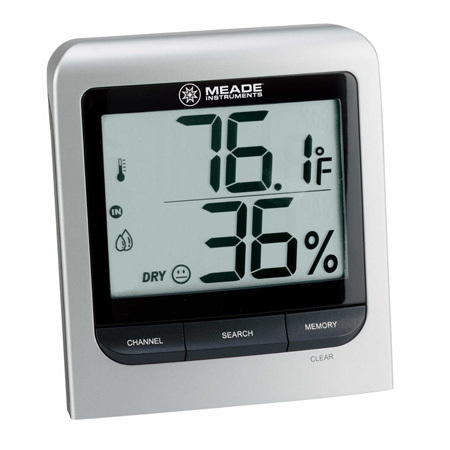 Like digital time, indoor temp and humidity, min and max records, and comfort icon for levels of your indoor relative humidity between 40% and 60%. This display is big with digits easily visible for across the room. Focusing on large temp or large humidity numbers is your choice. To make the change just hit the switch button on the back of the instrument and you are done. The operational ranges of 302-604 are 20% to 99% RH for the humidity sensor and -4° F to 122° F for temperature – totally sufficient for this sort of home apparatus. Set up is straightforward with only 3 buttons at the rare side of the device. Changing the CR 2032 battery also won’t be a problem. The accuracy of the humidity sensor appears to be within the 3% error when compared to more expansive and accurate gadgets. The Incbird ITC 608 T is a powerful controller that acts upon temperature and humidity levels at the same time. With rated of 1800 Watts at 15 amps – it is perfect for DIY applications, and can be very useful when brewing, fermenting or distilling. So when you want to use it for example – fermentation, and maintain certain temperature or humidity different then the ambient levels, this unit is good solution. The controller is breeze when setting up with the help of easy to navigate user manual. The readout screen of the device is clear with big red digits providing information about the current (PV) and set value (SV). The set value is the number that you want and the PV is the process value – the currently measured readings. On the bottom you have sockets for two sensors – humidity and temperature. For humidity you can controller levels form about 5% to about 99% RH with accuracy of 0.1% RH. And for temperature they are form -40 F to 221 F.
On the top of the model you have work one and work two sockets for connecting respectively humidifier and dehumidifier. Incbird ITC 608 T has many programmable features and is a powerful and accurate tool witch can definitely fit your DIY process.